My very first delta printer was/is a SeeMeCNC Rostock Max from before there was a V1. My entire experience is documented on the SeeMeCNC forum in my thread Mhackney's Rostock Max starting with unboxing on Jan 31, 2013, initially assembly and all of the testing, printing and upgrading I've done sense. Not much is original on the old girl, basically the frame and towers and even the frame has been modded to make room for twin power supplies. Now a little more than 3-1/2 years later and Rostock Max V1, V2 and now the new V3 I felt it was time to build another Rostock Max as stock in order to help the community and to see how it performs now that it has a completely new hot end, extruder, carriages, arms, effector, and even an accelerometer probe! Lots of technology packed into a sub-$1000 kit for sure. It's exciting to start "clean"! The new V3 also has a Raspberry Pi option and space in the head to support wireless printing with either OctoPrint or AstroPrint. I dabbled in OctoPrint and RPi a few years ago. I liked the web interface, did not like the anemic RPi. The new V2 RPi has a quad core processor so it should be much more up to the task. Unfortunately, SeeMeCNC was out of the RPi 3 when I placed my order last week. So I ordered from Amazon and the RPi arrived today. My Rostock Max V3 was shipped today and expected to arrive on Thursday so I have a little time to set up the RPi and OctoPrint. 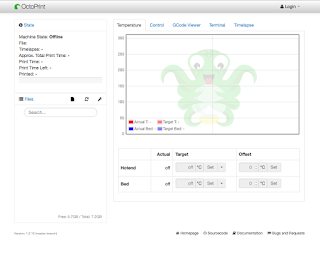 Here's a great - and current - video on setting up OctoPrint on an RPi V2. The big difference really is the built in WIFI on the V3. The instructions include setup from both Windows and Mac. I'm on a Mac so I'll add a little more color for Mac users, Windows is the default in the video. The first thing one needs to do is prepare the SD card with the OctoPi boot image. The video explains this for Windows users. Mac users can get the details here. 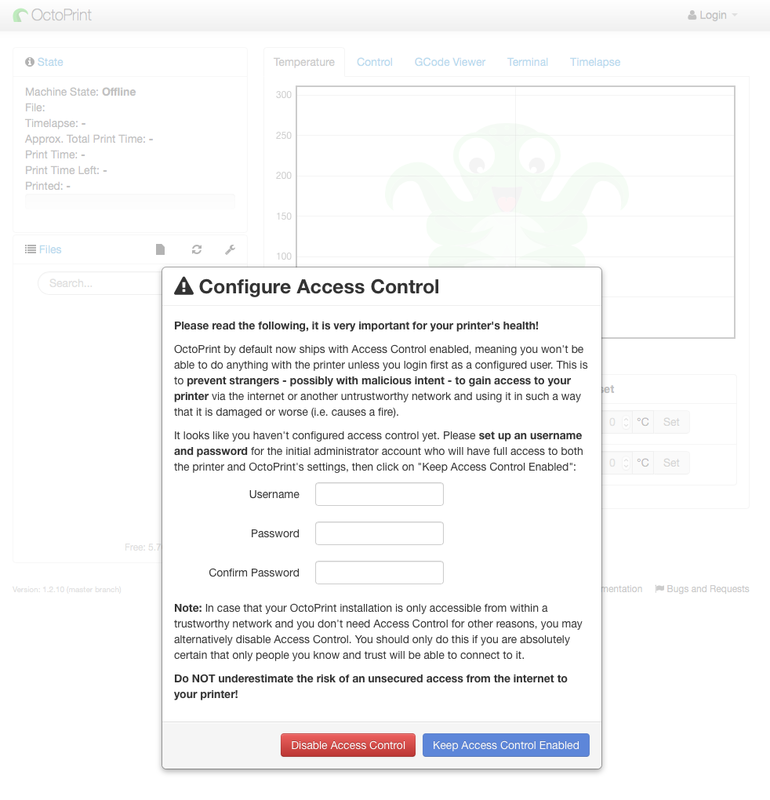 I formatted my card as FAT 32 and installed the latest OctoPrint for RPi, currently OctoPi version 0.13. It took nearly 12 minutes for the install to complete using dd from the command line in Terminal. Although the instructions at the above link say to eject the card once the command finishes, don't! We need to edit the octopi-network.txt file first. (assuming you are planning to use WIFI). # a wifi network that uses either WPA/WPA2 or WEP encryption. # that matches your wifi setup and fill in SSID and passphrase. Basically, you need to enter your network's SSID and your password. I use WPA/WPA2 security. Edit the appropriate section for your environment and don't forget to remove the leading '#' on those two lines and the "iface..." line above them, as show above. Now you can save and eject the disk. Insert the SD card into the RPi (on the bottom of the V3) and power it on. I used an external 5V supply, you need at least 1A of power. After a few seconds the red LED status should glow and the green LED next to it flash. You can check connectivity by running ping octopi.local from the Terminal. You will be asked for a password, the default is raspberry. 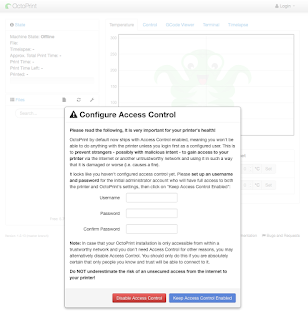 Now you can run the passed command at the pi@octopi prompt, it will ask you for the existing password (raspberry) and allow you to set a new one. Make sure to remember it! Now run sudo rasps-config at the prompt. You will see a Configuration Tool screen with the first item: 1 Expand Filesystem selected. Hit return, that's what we want to do to let OctoPrint use the entire SD card. Click RETURN on the confirmation screen to accept. Now click TAB twice so <FINISH> is hi-lighted and click RETURN, then YES on the next screen to reboot. Since I don't have my V3 yet, there is nothing to connect to! But now I have my RPi setup with OctoPrint and I'll be ready to go. 3 comments to ''Preparing for my new SeeMeCNC Rostock Max V3"
Can I connect the octoprint from my smart phone when I am at work? In theory, yes. Firstly, I would NEVER recommend printing unattended. These printers can and do catch fire. Your insurance likely will not cover you if you are not there (US, I can't speak to other contrived). It's dangerous, read my post here about SSRs. If I was not there, the house likely would have burned down. Hi! I recognize that this post is 3 years out of date, but it's been a great help in getting me halfway to using OctoPrint with my new Rostock Max V3.2, but I've hit a roadblock. 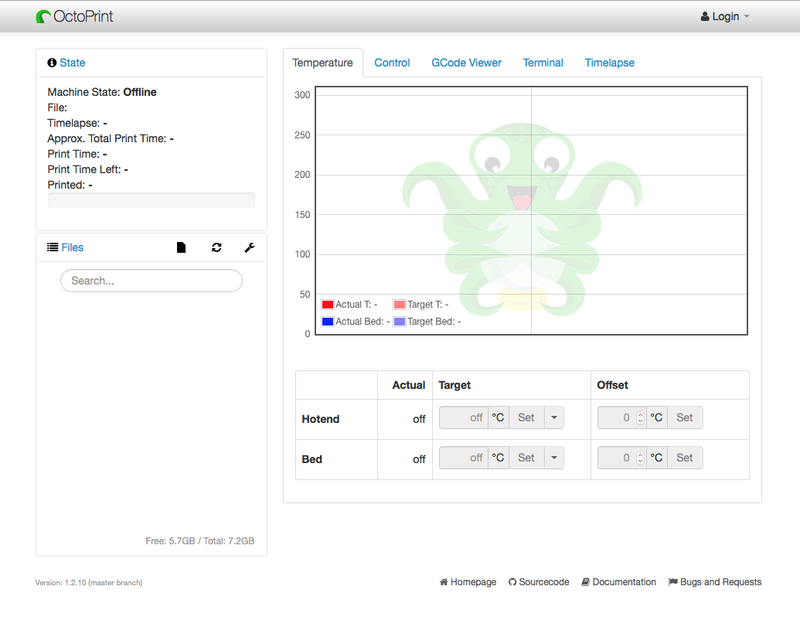 The RPi seems to recognize the printer when plugged in and declares it "operational" but when trying to do anything other than turn off or on the bed fan, OctoPrint declares the printer's firmware to be erroneous and disconnects. Additionally, OctoPrint is reading the printer's bed temp as being 2000 degrees, and I'm not sure what to do about that either. I'm still very new to 3D printing so any advice is appreciated!